This energetic city is bursting at the seams with attractions! 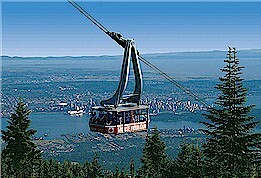 People come from all ends of the earth to see some of the most divine Vancouver attractions and views. You will find the city's top recommended attractions to visit while you are touring around this fabulous city of action. Every city has their top must-see's and do's and this famous city has a wide selection of them! On your adventure, you will experience the beautiful coast, the outdoors and loads of natural, historical and cultural activities. Check them out here! As seen above, this well known golf ball look-alike called Science World is a former Expo '86 pavilion. Today, it is a top family destination that offers educational, entertaining and interactive exhibits. Three main galleries explore the areas of music, biology and physics. A 3-D laser show presents fun images. The biggest attraction is the Omnimax Theater, which features science and nature films on one of the world's largest dome screens. Click here for more information on rates, events and hours of operation. 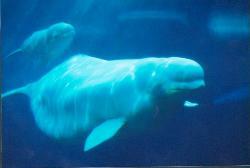 Only 15 minutes from downtown is Vancouver?s premier all-season attraction. When visiting, your adventure begins aboard the famous Grouse Mountain Skyride as you embark on a one-mile journey to the mountaintop. In the summer time you will discover the World Famous Lumberjack Show, The Refuge for Endangered Wildlife, Birds in Motion Demonstrations and an array of mountain top nature trails. Grouse Mountain also offers a winter wonderland of adventure including 25 ski and snowboard runs, 10km of snowshoe trails, sleigh rides, an 8,000 sq. ft. outdoor skating rink and much more! The dining options available at Grouse Mountain will get your taste buds rolling and the stunning views will be perfect for that romantic dinner with someone you love. The Observatory Restaurant offers an award winning fine dining menu and elegant atmosphere. For more casual dining, the Altitudes Bistro offers contemporary West Coast cuisine and an amazing patio overlooking the vibrant city of Vancouver. 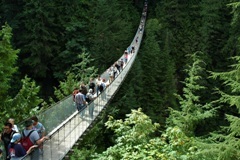 Everyone that visits Vancouver should check out the Capilano Suspension Bridge! BUT only if you aren't one who is fearful of heights of course. Breathtakingly suspended 230 feet above and 450 feet across Capilano River, Capilano Suspension Bridge allows visitors to view towering evergreens, serene trails and the award winning Vancouver attraction, Treetops Adventure. This walk takes you high above the forest floor for a thrilling encounter with the very heart of the forest. A guided nature walk reveals the mysteries of the forest and stunning views of the canyon. Take your camera so you can show how brave you are to your friends and family back home! The Vancouver Lookout located at the Harbour Centre is the best place for all visitors to stop when they first arrive in the city. Take an exciting ride up the exterior glass elevator and arrive at the top of Vancouver a minute later to a breath-taking view, which will remain a memory forever. 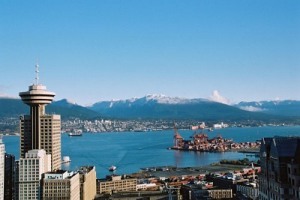 For those locals, tourists and visitors that are looking for a phenomenal view and a somewhat awakening experience, come visit the Vancouver Lookout for an amazing 360 degree view of Greater Vancouver, the eye-catching North Shore Mountains and if it's a clear day, you might even see Vancouver Island just off the glorious Pacific Coast. Please add to this page if you have a comment on any Vancouver attraction or would like to provide other Tourist information.